The importance of the meeting between Hibernian and Kilmarnock is disturbing to both sets of supporters. Events at Easter Road will dominate attention on the final Saturday of the Scottish Premiership season, but fans would have preferred the humdrum nature of a meaningless occasion. Survival is at stake, since they are the only sides remaining in the contest to avoid finishing second bottom and being consigned to the anxieties of the relegation play-off. The home side need to win to overtake their opponents, who can settle for a draw to secure their place in the top flight for another season. Tension will crowd the game, but drama could still find enough room for expression. Here are other final-day contests when two teams were battling for the one prize. Even the decisive touch was not applied until the final possible moment. Liverpool only needed a draw to secure the title, while Arsenal needed a two-goal win. The home side, whose title challenge was stitched together by the emotional determination that gripped the club in the aftermath of the Hillsborough tragedy, were expected to prevail since their defence was solid and well-marshalled. They kept Arsenal at bay until Alan Smith scored just before half-time, but a weary helplessness overcame them in the end. There was little resistance as Michael Thomas surged beyond desperate challenges. "Arsenal come streaming forward now in surely what will be their last attack," described the commentator, Brian Moore. "A good ball by Dixon, finding Smith, for Thomas, charging through the midfield. Thomas, it's up for grabs now! Thomas! Right at the end! An unbelievable climax to the league season." 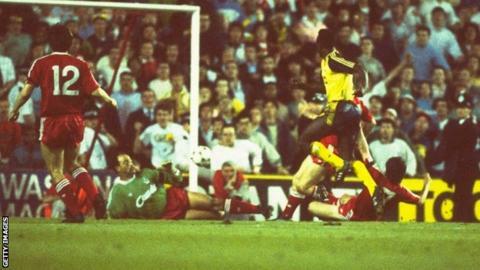 After lifting a shot over Bruce Grobbelaar, Thomas celebrated with a forward roll and, after just 25 seconds more, the final whistle was blown. Two years later, the midfielder joined Liverpool. Victory would have sent Brentford into the second tier of English football and a mood of joy, hope and anticipation reverberated around Griffin Park when Martin Rowlands scored just after the interval. Alan Pardew had made a point beforehand of describing his Reading team as the best footballing side in the division and portrayed Brentford as limited to a long-ball game. The psychology was misplaced for a game that was beset by tension. Relief was provided for the visitors by Jamie Cureton, who equalised with a measured lob with only 13 minutes remaining. The draw was enough to send Reading up and the prospect of missing out enraged the home side. Tempers were raised after Mark Williams brought down Graeme Murty, the Reading defender, and a brief fight ensued. Visiting fans also invaded the pitch afterwards. "I feel such relief that I can hardly tell you about it," said the Reading chairman, John Madejski, as he sipped from a can of lager. The significance of a prize is not always immediately evident. The meeting of these two teams on the final day of the season to decide which would secure the fourth and final Champions League qualifying place would have seemed of minor importance compared to the established glory of winning the title or the relief of avoiding the drop. Few people understood what was truly at stake, though, as Liverpool sought the victory that would move them into fourth place. A Russian oil tycoon with no public profile but eye-watering wealth was paying close attention to the outcome. The Chelsea players, too, were on edge, since the chief executive, Trevor Birch, had informed them before kick-off that failure would result in drastic cost-cutting, with the club's finances listing. Sami Hyypia's opening goal would have alarmed the home players, then, but they fought back through Marcel Desailly and Jesper Gronkjaer. Although a draw would have been enough for Chelsea, the latter's strike is now referred to as the £1bn goal, since it heralded the beginning of the Roman Abramovich era, with the Russian convinced that buying Chelsea was worthwhile with the club competing in the Champions League. "We all knew what we were playing for," said Gronkjaer. "I remember the stories about our financial situation. I was on holiday in Denmark in my summer house when I heard about the takeover. I didn't imagine he (Abramovich) would have so much money and everything would change." Home advantage was barely enough to sustain Kilmarnock. They were under the guidance of Jimmy Calderwood, who was brought to Rugby Park in the January to try to save the club from relegation and he was facing a comparative rookie in Stephen Pressley, who had replaced Eddie May three months before and insisted he would save Falkirk from the drop. Hackles were raised, but the game itself seemed oblivious and looked to be drifting towards the 0-0 draw that would keep the home side safe. Desperation was liberating for Falkirk, though, and they came within an inch of scoring a decisive goal in the closing stages when a long ball upfield was headed down to Ryan Flynn inside the penalty area. But his half-volley skimmed the crossbar and Kilmarnock hung on through five minutes of injury time. "It was absolutely horrible," said Calderwood afterwards. "It was horrendous, I never want to go through it again. I'm glad it's finished." History hasn't always been an ally to Ajax. The club's glorious past would have felt like an indictment to the teams that could not match up to the European Cup winning exploits of the teams of Rinus Michels and Louis van Gaal. The club eventually turned to that history for rejuvenation, though, by appointing Frank de Boer as manager in December 2010. He obliged by renewing old principles of passing, attacking football and an accomplished youth development strategy. There was an immediate reward, too, since he delivered the club's first league title in seven years despite going into the final game one point behind the leaders and defending champions FC Twente. Siem de Jong and Denny Landzaat established a comfortable lead for the home side, but Theo Janssen pulled one goal back for FC Twente, who had defeated Ajax to win the Dutch Cup the previous weekend. Nerves grew among the home fans, but De Jong's second goal of the game secured the title and set De Boer on the path to an impressive managerial career.